The destroyer Lassen will sail near closewithin 12 nautical miles of one of China's man-made land masses in the Spratley Islands Monday night in a closely watched show of force, according to a defense official who spoke on background confirmed. The Lassen is expected to pass within 12 nautical miles by several of the Chinese-claimed reefs, including Subi Reef and Mischief Reef, where China is suspected of building runways that can accommodate military aircraft in moves that have sparked tensions in the region. Prior to the patrol, a vessel with China's People's Liberation Army-Navy shadowed the Lassen. the Lassen was being shadowed by a People's Liberation Army Navy vessel, but was unable to confirm it was being shadowed ahead of the patrol, which was scheduled to take place in the early morning hours local time. The patrol is what's know as a freedom-of-navigation patrol, intended to challenge Chinese claims of sovereignty over the islands, which China is using to bolster its claims to control over nearly all of the South China Sea. Six nations in the region lay claim to parts or all of the Spratly Islands, a collection of reefs, rocks and other natural features. 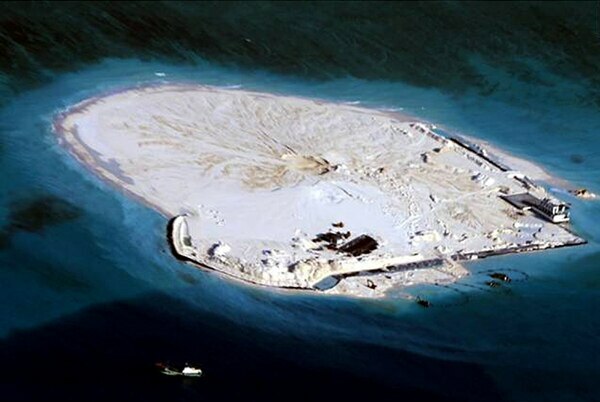 In the last two years, China has begun constructing islands on top of the reefs and claiming territorial seas around them to gain fishing and resource rights to most of the South China Sea. This undated handout photo released by the Department of Foreign Affairs (DFA) shows the alleged reclamation by China on what is internationally recognised as the Johnson South Reef in the South China Sea, otherwise known as the Mabini Reef by the Philippines and Chigua Reef by China. The Philippines warned on May 14 that China may be building an airstrip on a reef in the South China Sea, boosting the superpower's claim to most of the strategic Asian waters. AFP PHOTO / DEPARTMENT OF FOREIGN AFFAIRS (DFA) --- EDITORS NOTE -- RESTRICTED TO EDITORIAL USE - MANDATORY CREDIT "AFP PHOTO / DEPARTMENT OF FOREIGN AFFAIRS (DFA)" - NO MARKETING NO ADVERTISING CAMPAIGNS - DISTRIBUTED AS A SERVICE TO CLIENTS --- THIS PICTURE WAS MADE AVAILABLE BY A THIRD PARTY. AFP CAN NOT INDEPENDENTLY VERIFY THE AUTHENTICITY, LOCATION, DATE AND CONTENT OF THIS IMAGE. THIS PHOTO IS DISTRIBUTED EXACTLY AS RECEIVED BY AFP. Alleged reclamation by China is seen on what is internationally recognized as the Johnson South Reef in the South China Sea. Lawmakers and observers have been calling for the U.S. to conduct a freedom-of-navigation patrol in the Spratley Islands to counter China's claims, arguing that failing to do so legitimizes China's claims.that acting as if the claims are legitimate by avoiding the 12-mile limit only lends China's claims credence. Navy Times reported the patrol was imminent Oct. 8, pending approval from the Obama administration. China has publicly called for the U.S. to avoid militarizing the dispute by sending a warship through their claimed territorial sea and has pledged not to put military equipment on the island. After news of the pending patrol, the U.S. Navy's top officer said in mid-October that the pending patrol was not intended to be seen as aggressive. "I think that we have to continue to proceed in accordance with international norms," Chief of Naval Operations Adm. John M. Richardson told reporters Oct. 15. "[This is] part of routine navigation in international waters, consistent with international rules there: I don't see how these could be interpreted as provocative in any way." Virginia Republican Rep. Randy Forbes, one lawmaker who has been vocal in calleding for the Navy to patrol within the 12-nautical-mile limit, drawn by the Chinese around their newly constructed islands praised the decision to green-light the mission. 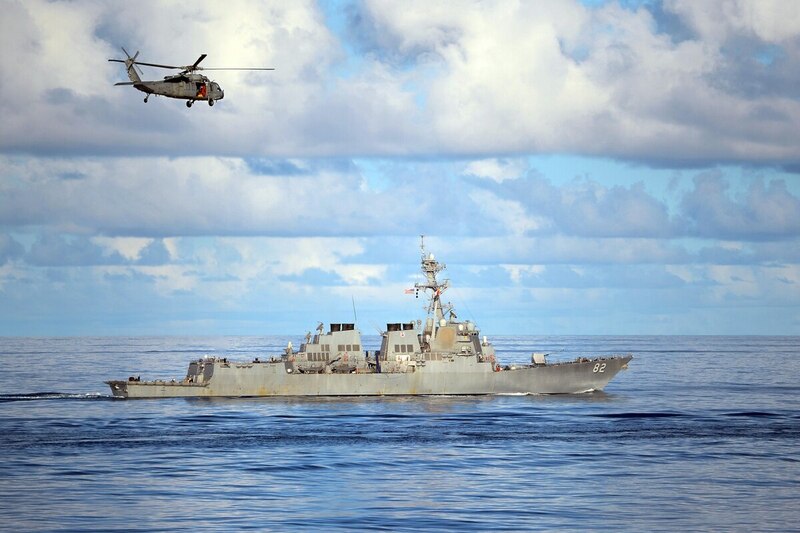 "The passage of U.S. vessels within 12 nautical miles of China's man-made features in the South China Sea is a necessary and overdue response to China's destabilizing behavior in the region," Forbes said in a statement. "International law is clear that China has no legitimate claim to sovereignty over these waters, and it is high time that this administration reaffirmed America's enduring commitment to freedom of navigation and the maintenance of peace and stability in the Asia-Pacific region."